LeBron James, Paul George and Kawhi Leonard will play a major role in many teams' offseason moves. The end of the season hits you like Cher hit Nicolas Cage in "Moonstruck." For the prior six months, every waking moment was infused with a singular hope: we have a game tonight. Anything that had gone wrong in the past could be corrected tonight (or, tomorrow). There was another chance to remake, to get better, to build. And for those teams that make the playoffs and then lose, the slap is a double-whammy: the potential to win a championship is there, and then not only is it gone in an instant, but the season ends, too - abruptly, finally. This past Elimination Week in the NBA playoffs proved particularly potent. Rarely have so many star players' futures been so uncertain. And as you must know by now if you've followed the history of this league at all, star players drive everything. They are the show. And nothing happens until they decide what they are going to do, on and off the floor. And so the league will now have to wait for LeBron James, and Kawhi Leonard, and Paul George, to see what they will do. It starts with James, of course, but James is his own terraformer, shape-shifting entire franchises by a single phrase - "I'm in" or "I'm out." The next Decision will have to wait at least another couple of weeks after James maxed out in a Game 7 first-round series win Sunday against the Pacers. Doing so sets up Cleveland for an Eastern Conference semifinals date with the top-seeded Raptors. But everyone will have to wait for James to decide/announce his intentions before the free agent pile can move forward in July. Few organizations in sports have been as stable as the Spurs have been over the last two decades. Win or lose, you always knew the Spurs would tinker along the margins, improve from within and be a contender the next season. With Leonard's quad injury and his distance - figurative and literal - from the team this season, there is no telling what the next version of the Spurs may be. "It's odd," Spurs guard Danny Green said in the quiet San Antonio locker room Tuesday, after they were eliminated by the Warriors. "We don't know. I don't think they (management) know. A lot of the league, I don't think, knows - there's so much changing up and down, with teams. It's the way the game's played - cap space, who's going where, who wants to play with who. You have to adapt and adjust." So even San Antonio has to enter the New NBA, where players have primacy in forming teams. They're pulling out all the usual stops there to keep Leonard in town, but the public nature of the disagreement between him and the team was so unprecedented for that franchise, it's hard to assess the impact. And yet, there has been regular communication between Leonard's representatives and the team, with two members of the Spurs' organization up in New York while Leonard has rehabbed his injury at the National Basketball Players Association's headquarters. But this has always felt like much, much more than a disagreement about a diagnosis of Leonard's quad. The Spurs have so many decisions to make, starting with their oldest veterans. Tony Parker will turn 36 before next season starts, and he has said his goal to finish his career is to play three more seasons in San Antonio to get to an even 20 years with the Spurs. But he'll be a free agent this summer with no guarantees he'll be asked back. Pau Gasol will be 38 on opening night next season, but he is under contract for next year at $16 million and was adamant after the season-ending loss to Golden State he plans to play next season, presumably for San Antonio - though he also made it clear he'd like more playing time coming off what he said was one of his most efficient seasons. And Manu Ginobili will be 41 when next season begins. He certainly looks like he can still contribute on the floor, based on some of his heroics this season, and he's only on the books for $2.5 million next year. He said he's likely to take a month or two as he usually does after the season to decide whether he, as he put it, can see himself "as an ex-player." But Leonard will come first. There will be a meeting between him and the team's top brass, but no one seems to know when that will come to pass. Spurs coach Gregg Popovich is still, obviously, grieving over the loss of his wife, Erin, who died on April 18. Everyone understands it will take him some time to feel that anything involving basketball is worth his time again. So everyone will wait. When and if that happens, the franchise and its star player have to decide if they can get on the same page again. The sense one gets is that Leonard isn't burning to leave town, but at 26, he realizes this is his best and last chance to look around, see what else is out there. And he sees other franchises that allow their superstar players a certain, shall we say, leeway in determining how they'll handle their business. They bring friends into the organization, both formally and informally, to guide them and give them familiar faces with which they're comfortable to travel with and hang out with at home. That is not the Spurs' Way. Don't get it wrong; family is a huge, central part of the Spurs' fabric. One can never forget the sight of Tim Duncan's kids with him on the floor at halftime of a Finals game a few years ago. One of the reasons the franchise was so devastated by Erin Popovich's death was the numerous and quiet kindnesses she performed for players and their wives and families over the years. But when it comes to the white lines, the Spurs are all business, taking their cue from Popovich and GM R.C. Buford. Why wouldn't they insist on things being done a certain way? They have five rings setting the standards, with the players willing and able to police themselves because there is no one else to whom to appeal. This isn't the same as being flexible in terms of strategy; no team has reinvented itself more than the Spurs have. This is about the way they do things, just as there's no getting past the definition of the Patriots Way as whatever their coach, Bill Belichick, says. Period. There is no similar problem at present in Oklahoma City, just an eerie uncertainty that one of those Acme anvils that always dropped on the Coyote's head just as he was about to throttle the Road Runner is about to drop on the Thunder. Paul George has always said the right things about the Thunder since he got to Oklahoma City almost a year ago. And the franchise has done everything it could to make its best possible case for him to stay long term. But George has also been very consistent - he would be a fool to leave OKC if it made the conference finals or the NBA Finals in his first season there. However, the Thunder will not make either one of those series this year. And there are very few around the league who don't believe George won't now bolt - whether for Los Angeles and the Lakers or somewhere else. That would leave OKC with nothing to show for its trade of Victor Oladipo and Domantas Sabonis to Indiana for George, with only Carmelo Anthony likely to return once he opts in for next year at almost $28 million. It's hard to see OKC being able to make a credible case now that it can provide what George says he wants - a chance to compete for championships. Whether he could do that in LA obviously depends on whether he can partner with another star player. There were times this season when George and Russell Westbrook looked great together. But after some stumbles out of the gate, the Thunder did away with Egalitarian Russ and put the ball back in his hands where he's at his best. And he's so good, that's often good enough for the Thunder. But you need more hands in the playoffs. And by the end of the first round, George was openly questioning his shot and falling well short of his lofty standards with a 2-of-16 finale in Salt Lake City, while Westbrook took 43 (!) shots in that Game 6 ouster. The Thunder had dreamed of a secure, post-Kevin Durant world with a Big Three that would divvy up the shots and wins like Halloween candy. Instead, the end of the season came hard and fast across OKC's cheek, like Loretta Castorini, leaving George free to go and the Thunder helpless to stop him. 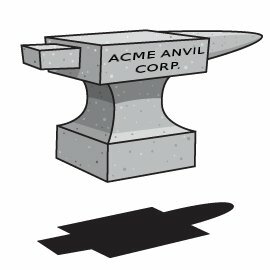 Where's an Acme anvil when you need one?